I’m turning 29 in a few weeks. Sparked by the idea that Saturn returns and brings all kinds of big changes around this time, I’m posting a series of interviews asking friends and near-strangers all sorts of nosy questions about what their lives were like at my age. Soon after I moved to Brooklyn in 2010 I went in search of a yoga “home” and quickly found it in Aditi Dhruv’s Slow Flow class on Monday nights. Though the Park Slope studio was a bit of a trek from my apartment, and though I took on a lot of weeknight commitments, it quickly became sacred. It was one of the few things I really tried to do every single week that I was in town, because it stretched me out and calmed me down but also because Aditi is one of those teachers who always seems to say exactly what you need to hear. Most of the time she got down to business pretty quickly. She wasn’t the kind of teacher who would begin class with some long drawn-out philosophy (although after the Times published that article about how yoga can “wreck your body,” she did give us a very serious mini-lecture about how “we are responsible for our own experience”). If she sensed the group slacking, she might get a little stern; then, occasionally, just when the energy in the room felt hard and heavy, she’d find a way to crack herself and all of us up. Sometimes she’d play this and I’d think about how I wouldn’t live in New York forever and fight back tears. Sometimes she’d play this right as we were in some final balancing pose, about to reach our limits, and it made everything feel hilarious. Most of the time things were very quiet and focused. At any rate, if you’re in New York and want a delightful yoga experience, check out her website, or just show up to her classes at Bend and Bloom. I’ll be jealous. Aditi: “Saturn returns” really didn’t mean anything to me, I’d never heard of it until I turned 28. And then, like you, everyone began clucking about my Saturn returning. And to be honest, I still don’t know what it refers to exactly – I keep envisioning the huge planet doing a U-turn in outer space. I understand that it’s supposed to be a big time in one’s life, new beginnings, new steps, life challenges and changes, etc. J: Where were you when you turned 28? What do you remember about that time? A: I was in NYC, living in Queens and headed to India for a few months. Even though I don’t remember feeling connected to the idea of Saturn returning, looking back, I realize that I was in/did go through a tumultuous time. And going to India for a few months was a sign of that – although I always love being there, being with my family, in hindsight I see that I was also getting out of NYC fast. A: My advice to anyone, at any time really, is to slow down. Be mindful. Even be mindful that one may not have answers or a path may not be apparent right now. But if we slow down, quieten ourselves, and listen to our deepest instinct – we know the answers. We already have the wisdom we seek – it’s a matter of pausing, taking a deep breath to refresh ourselves, and observing. 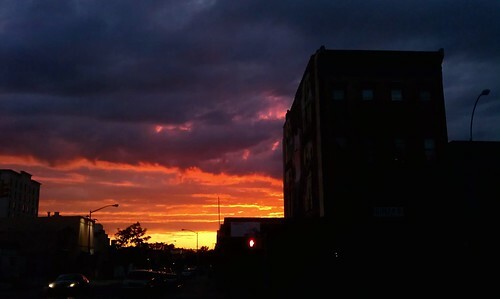 Photo: Phone snapshot of the sunset after my last Slow Flow class this past June. Previous “28 in 29″ posts: Intro; Hannah, #1; Kara, #2; Saya, #3; Cathy (aka Mom), #4; Rachel, #5; Jen, #6; Cathy W., #7; Celeste, #8; Deanna, #9; Kyra, #10. This entry was posted in People, Projects and tagged 28 before 29, India, mindfulness, saturn returns, yoga. Bookmark the permalink. ← 28 before 29, #10: Kyra Gaunt, Ph.D.
What an interesting interview series! Thanks for posting.